On August 29, 1970, some 25-30,000 mostly Chicano people marched through the heart of East Los Angeles. This enormous, community-based familia included elders and parents and babies, students and teachers and seasoned political activists, documented and undocumented workers from the factories and the fields, and veterans from World War II and Korea and Vietnam. They came together from barrios all over the country: from San Diego, from Chicago, from Denver, from San Antonio, from Seattle. From New York, a large contingent of Puertorriqueño members of the Young Lords Party joined them. Here, at the National Chicano Moratorium Against the War in Vietnam, organizers declared that, for Chicano youth, the front line in the struggle for justice and human rights was not in Vietnam, but rather, in the barrios of the United States. Soon after the march was over, thousands of demonstrators entered Laguna Park to hear the speeches and entertainment—and squads of LA county sheriffs, backed up by busloads of city police, attacked, wading into the crowd with tear gas rifles and batons. Most of the people tried to run for safety. There was none. Some fought back. By the end of the day, the cops had injured and arrested many, and killed three Chicanos, including the well-known and -respected journalist Rubén Salazar. For many reasons, the Chicano Moratorium was a day to remember and a day that the Chicano people hold in their hearts. It was a new day that was instrumental, a few years later, in ending the draft and the US war against Vietnam. 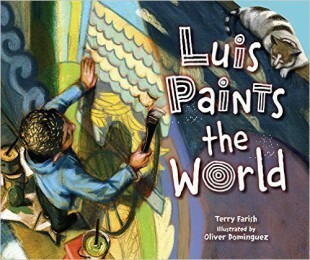 The great Chicano Moratorium is the context in which a colleague and I read Terry Farish’s picture book, Luis Paints the World. Here, young Luis, who is Dominican American and lives on the East Coast, can’t understand why his older brother, Nico, has decided to join the army and is about to be deployed. Nico’s answer is simply—and incomprehensibly for young readers and everyone else as well—that he will be “[s]eeing the world. Just like the army promised.” This is all that’s said about Nico’s military service. We don’t know where he’s going, we don’t know why, and we don’t know if or when he’ll be back. Just that he’s wearing camo (referenced in the art, but not the story) and he’s being sent “far away” “to see the world”—a phrase that Farish inserts into the story nine times. Luis, who doesn’t want Nico to leave, tries to convince him that “the world” is right here, by painting “the world” as a mural on an alleyway wall. But Nico leaves, and, as Luis awaits his return, neighbors join in to paint their world. Although Mami hints that, “some people don’t come back,” Nico does, and the reunification—as is the mural—is complete. The murals in Dominguez’s brightly colored artwork—in what appears to be rendered in pastels—are chalky and less detailed than the people, who are more sharply outlined. This is a close-knit, economically marginalized Dominican neighborhood, with plenty of concrete on which to paint. I especially like the double-page spread that shows adults and children working together to create a beautiful and lively depiction of their world. But. By creating a sanitized, feel-good picture book about a young Dominican American man who joins the Army to “see the world”—by focusing solely on peace and art and a thing called “multiculturalism”—Farish ignores the harsh realities of the lives of poor and disenfranchised people and the political and economic issues of why Latinos and other peoples of color disproportionately enlist in the US military. By doing so, and by ignoring the historical, political and cultural significance of the Chicano Moratorium and its aftermath, she is lying to innocent little kids about armed combat, about who goes and who gets to stay home, about US imperialism and world hegemony, and about peace, justice, community, struggle, and protest. Luis Paints the World is not recommended. Older readers who are looking for the important historical context omitted here should read Benjamin Alire Sáenz’s outstanding YA novel, Sammy and Juliana in Hollywood (Cinco Puntos Press, 2004). Mil gracias a mi colega, Ricardo Ramirez. As always, the reviewer reminds us of the historical perspective and makes us question why the author simplifies going off to war as "see the world." Fortunately, the author does have Mami warn Luis that "sometimes people move on" and don't come back. I am puzzled why in the glossary the author, instead of translating Naranja dulce, she completely changes the song. "Dame un abrazo, que yo te pido" in English becomes "Give me a hug, keep me in your heart." What was her point? Thanks, Cathy. Seems no one cared about the Spanish. My personal peeve is that there's an initial interrogation mark (¿) missing in the question that reads, "Qué lo que?"